How amazing would it be to have a newly discovered creature named after you?!? Well, that is exactly what happened to world renowned physicist Brian Greene. 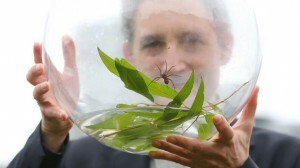 A new type of water spider was discovered hanging out in the streams of Brisbane. These spiders have an interest in physics just as Professor Greene does. Click here to read the full article. In the article, the recent discovery of Einstein’s gravitational waves is presented. This theory has been in the works for 100 years, started by Einstein, and was just proven true through the spiraling of two black holes into each other (One 36 times the mass of the sun!). For more information on this discovery, click here. Ponder this: You are being honored for your work and will have a creature named in your honor. If you were able to choose, what creature would be at the top of your list? Leave a comment with your reactions to the articles or what creature you would choose! I would name a new species of whales after me. I would name a new species of zebra after me.